In early 2015, Roaming Roosters was founded in Washington, D.C. by a family with a unique concept. The idea of a food truck with fried chicken that you could feel good about eating: free-range, grain-fed chicken served fresh every day. Within months, word got out on social media about the delicious poultry menu and the demand for Roaming Roosters soon called for the expansion from one food truck to three. Since then, the popularity of the only food trucks in D.C. serving tasty free-range chicken has grown massively. Requests for catering, private events and scheduled food truck visits have been pouring in from D.C. and the surrounding areas of Maryland and Northern Virginia. The fast expansion of Roaming Roosters in just under a year is easy to explain - where your food comes from matters, and we bring that ideal to every meal we serve. What exactly is free-range chicken? A free-range chicken is a bird that is provided consistent access to the outdoors, fresh vegetation, sunshine and room to run around. These birds are not given antibiotics or chemicals of any sort. We believe it’s essential to raise livestock in a humane, natural way. 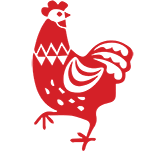 It's important to us that we select free-range chicken farms to work with exclusively - this way, we know the chicken we serve at Roaming Roosters is of the best quality possible. We care about where our food comes from because we care about the people we serve it to. Roaming Roosters’ mission is to provide quality comfort food that our customers can feel good about eating. Why do we do what we do? Well, we think fried chicken is a great way to lift spirits and bring people together. Our biggest motivator is making people happy. Whether it's during lunch hour on one of our trucks or at a private event, excellent customer service is a huge part of our daily routine. Roaming Roosters’ recipes are sure to spark an appetite in every lover of fried chicken, just follow the white truck with a red rooster, or visit our food truck schedules to see exactly where you can taste what everyone's talking about.